A user experience designer’s role on a team can seem ambiguous to teammembers sometimes. It’s useful to put an image with the concepts, which is what’s happening here. This illustrates how the UX role(s) are woven into every aspect of the development cycle. In this case, this is for a scrum team that has adopted a dual-track development style. When I make these diagrams, I intend for them to be references, not law. There are few connecting lines (that would indicate a rigid flow) because some features/products may require all or only some of the steps in each phase. As with everything in Agile development, room must be given for team style and feature need. The UX flow on a scrum team utilizing a dual-track development style. 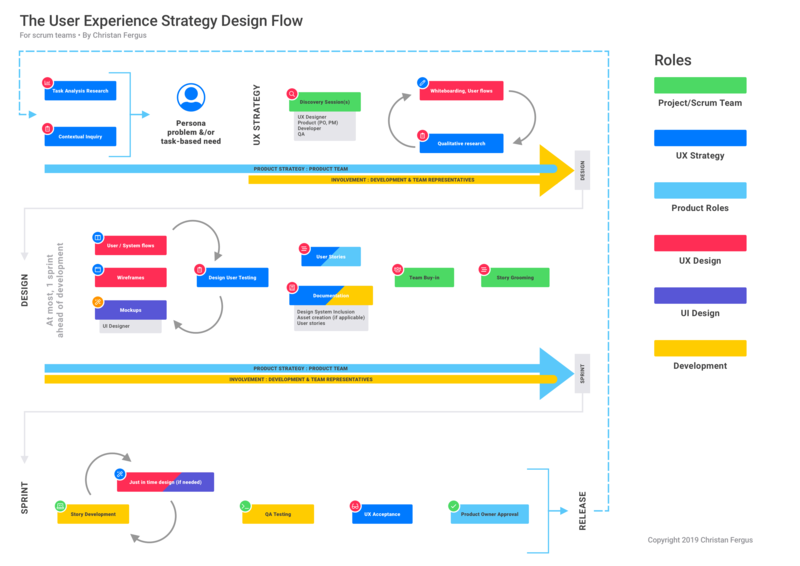 The UX Strategy Design Flow is presented as a loose flowchart and structured in a way to show overall phases without conveying the idea that each step must be rigidly followed. The design breaks out the process into three stacked phases, or, “swimlanes”, each grouping accomplishing an overall stage in the design process. Some or all of these steps may be done in this phase. It simply depends on what the particular feature needs. The final phase is the actual development sprint. It’s demonstrated that UX works closely with development and QA to assist, answer questions, updated designs if necessary, entirely through the development cycle. Once development and QA is completed, the final necessary step is to get UX’s sign-off that the design meets the user’s needs as expected. Once released, the process starts all over again to show that iteration is important to ensuring the user’s needs are always being evaluated, understood, and addressed as needed.